Are you looking for a new portable staging system for your auditorium or performance space? It may seem like a straightforward process, but one of the most important areas people often overlook is load ratings. We’re here to guide you through the basics, including the three main load ratings: standard uniform load, point load, and dynamic live load. The StageTek® portable staging system is designed with all of these load ratings in mind. The standard uniform load rating describes how much equally distributed weight a portable stage can safely support. This specification is typically in pounds per square foot. For example, a portable stage that measures 10-feet by 10-feet with a uniform load rating of 125 pounds per square foot may safely support 12,500 pounds of weight (10ft x 10ft x 125 pounds) evenly distributed across the stage. The higher the standard uniform load rating, the more weight a portable stage will safely support. Most building codes require that portable stages support a minimum of 125 pounds per square foot. 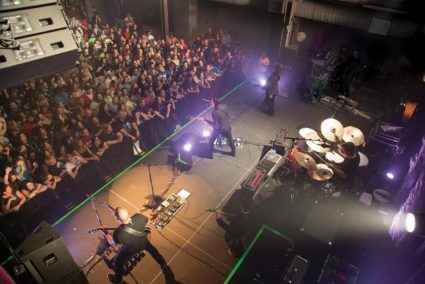 However, depending on the number of people and equipment on stage, you may need more than that. Portable stage manufacturers often have several different designs that offer additional legs, beams, or other support structure to increase the load rating. When selecting portable staging, make sure that the load rating is high enough for all of the people and equipment you plan to have on stage at any given time. StageTek® is light, strong, and versatile, making it ideal for any performance. The point load rating for a portable stage lets you know how much weight you can place on a single point without leaving a permanent mark or dent in the stage surface. This is a crucial measurement case you want to put a really heavy prop or grand piano on the stage. Manufacturers often give this specification as a weight applied by a pin or a caster. For example, 1,500lb applied via 1″ diameter pin. This rating means that if you set 1,500 pounds on a 1-inch diameter pin on your portable staging, it won’t leave a permanent mark or dent in the stage surface. It’s important to consider point load numbers when looking at portable stages even if you don’t plan on placing a grand piano on stage. A higher point load rating can provide a more durable surface that resists damage, like an accidentally dropped hammer. The dynamic live load rating is an essential factor to consider in your portable staging. But, in many cases, it’s not included in the manufacturer’s information. The standard uniform load rating is often static, but a group of high school students performing during a concert is never static. That’s why it is important to consider the dynamic live load rating. 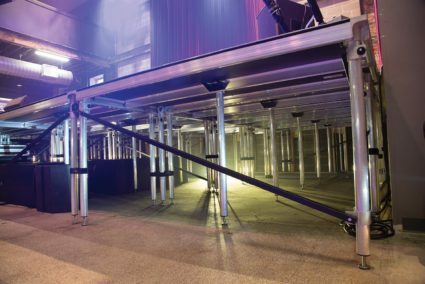 The dynamic live load rating is the amount of lateral force a portable stage has been tested to safely support while simultaneously supporting the maximum uniform load. For example, a 10-feet by 10-feet portable stage that has a standard uniform load rating of 125 pounds per square foot and a 15% dynamic live load rating. You calculate the side load as 15% of the total uniform live load or 1,875 pounds (10ft x 10ft x 125 pounds x 0.15). The higher the dynamic live load rating the greater amount of lateral force the stage can safely support without bending or collapsing. StageTek’s® innovative design provides optimal flexibility. Our engineers designed our StageTek portable staging system with all of these load ratings in mind. This approach provides a portable stage and riser system that’s light, strong, versatile, and easy to set up. 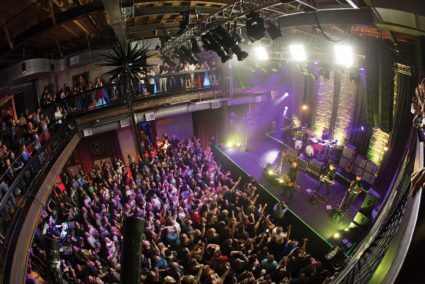 You can also use our StageTek system for any of your performance needs, whether they’re seated, standing, or anything in between. We also offer strong, simple, and inexpensive legs that can be stored underneath the deck for additional flexibility. Maximum Flexibility: Simple, economical, plug-in legs make hundreds of configurations possible. Strength & Stability: Among the highest load ratings of comparable systems based on the three most important load ratings. Fast, Easy, Intuitive: Anyone can set up StageTek in minutes. No tools needed. Safer: Higher load ratings in a deck that’s 20% lighter. Only StageTek provides rounded edges for a comfortable powergrip (75% stronger than a pinch grip). This helps save backs, fingers and toes. Takes Up Less Space: Save as much as 50% in storage space with an easy moving storage and transport cart. Legs can store in the decks keeping parts nearby for the next setup. Durable and Repairable: The lack of any folding connections in StageTek’s design eliminates the source of loose parts, noisy rattles and failures. StageTek’s simple, solid design has a best-in-class warranty and parts designed for easy replacement. Uniform load: Up to 200 lbf/ft2 (9.6 kN/m2). Dynamic Live Load: Side load of 600 lbs (2.7N) at rated uniform load on a 4×8 platform. Point Load: 1,000 lbs (4.4 kN) applied via 1” (2.5 cm) diameter pin. To learn more about portable staging, StageTek, and load ratings contact Chad Parrish, Product Manager at Wenger Corporation.